While Ulysse Nardin may not be a household name, within the luxury watch world it is a brand that is highly recognized and respected. Makers of very fine Swiss watches, Ulysse Nardin was in fact founded over a 170 years ago in 1846. Ulysse Nardin the man was a watchmaker who specialized in producing highly accurate marine chronometers—many of which were used by many of the world’s navies during his era. 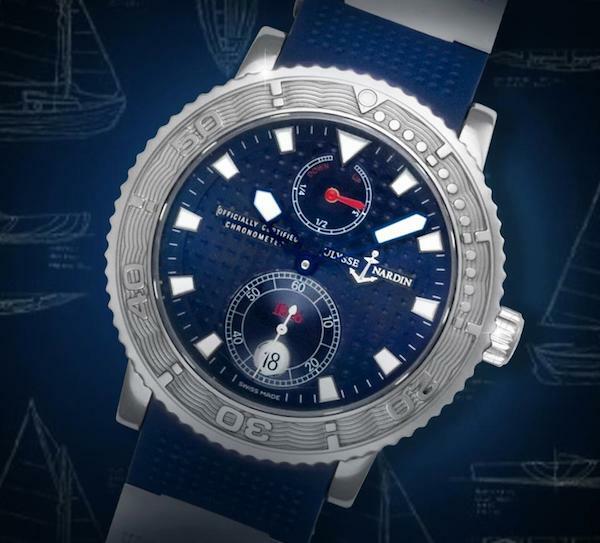 In 1996, the brand unveiled the “Marine Chronometer 1846,” which had a dial that was a miniaturized version of the vintage Ulysse Nardin marine chronometer devices used for navigation. 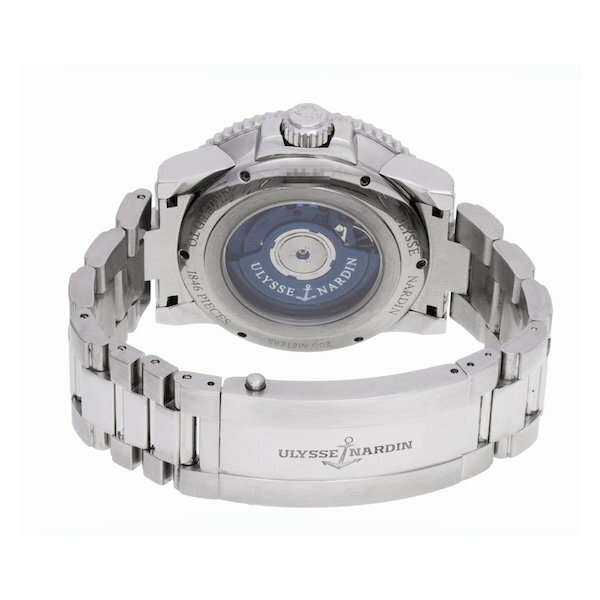 It wasn’t until 2003 that Ulysse Nardin introduced the Maxi Marine Diver collection built for underwater exploration. The Ulysse Nardin Maxi Marine Diver has since become a signature timepiece for the brand and today we take a look three different versions of this ultra-luxurious sports watch. 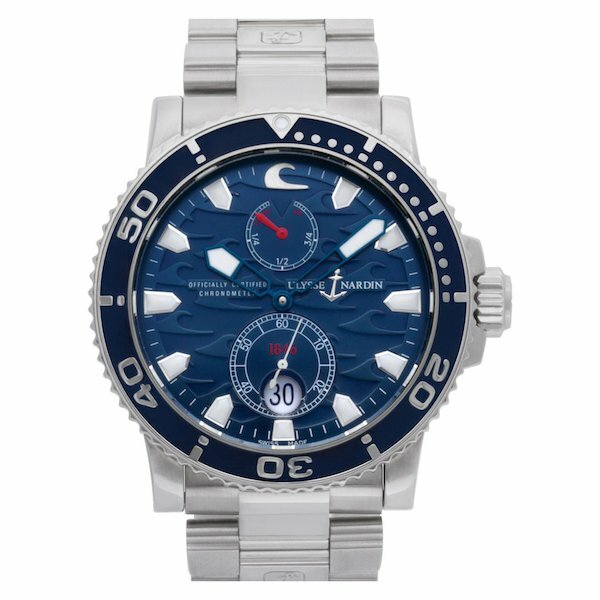 First up we have a white gold Ulysse Nardin Maxi Marine Diver ref. 260-32-3A. Limited to just 500 pieces, on the side of the 43mm white gold case you’ll see a unique number plaque on the left-hand side. Housed in the case is a blue lacquer dial with an appealing checkered pattern. As is typical with dive watches, this white gold Maxi Marine Diver includes plenty of luminescence from the oversized indices to the skeleton center hands. Also note the power reserve subdial and small seconds subdial, mimicking the brand’s original marine chronometer navigational clocks. Inside the subdial is a round date window with an inverted magnification lens. Matching the blue dial is the blue unidirectional bezel but this time featuring a wave pattern. Carrying on the blue hue is the blue rubber strap, reinforced with white gold links for a more comfortable fit and a white gold deployant clasp for optimal security on the wrist. Turn the watch around and you’ll see the COSC-certified chronometer automatic movement working away within via the sapphire caseback. Waterproof to 200 meters, you may not necessarily take this lavish white gold watch diving, but if you wanted to, it’s certainly up to the task. From a white gold version, now we take a look at the rose gold Ulysse Nardin Maxi Marine Diver ref. 266-58-3. The 43mm rose gold case is topped with a rose gold unidirectional diver’s bezel with the wave pattern background contrasting with the high polished raised numbers. The cream checkered dial compliments the exterior gold and black design elements and is home to the familiar Maxi Marine Diver layout with large skeletonized sword-shaped hands, trapezoid indexes, a power reserve indicator, a small seconds register, and a discreet date window. 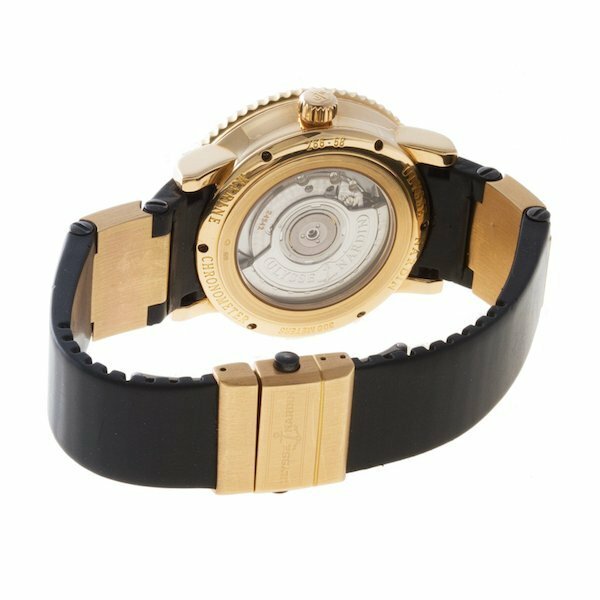 The black rubber strap incorporates the signature metal links, in rose gold, while the deployant clasp has a rose gold exterior and titanium interior. 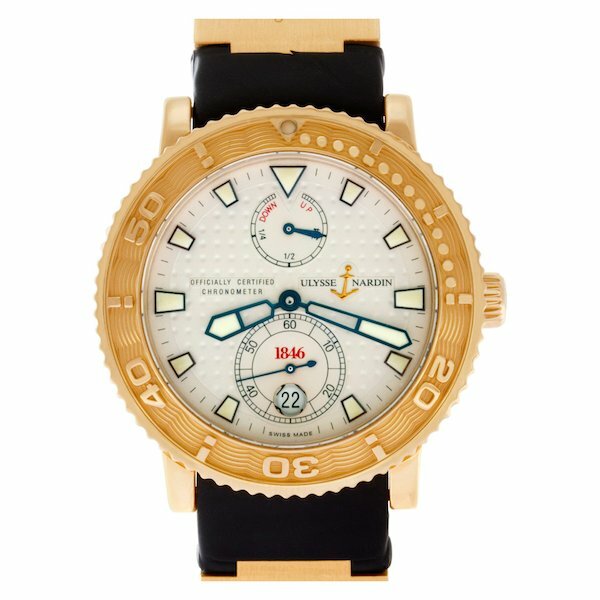 The Maxi Marine Diver ref. 266-58-3 offers more water resistance at 300 meters despite its sapphire caseback. 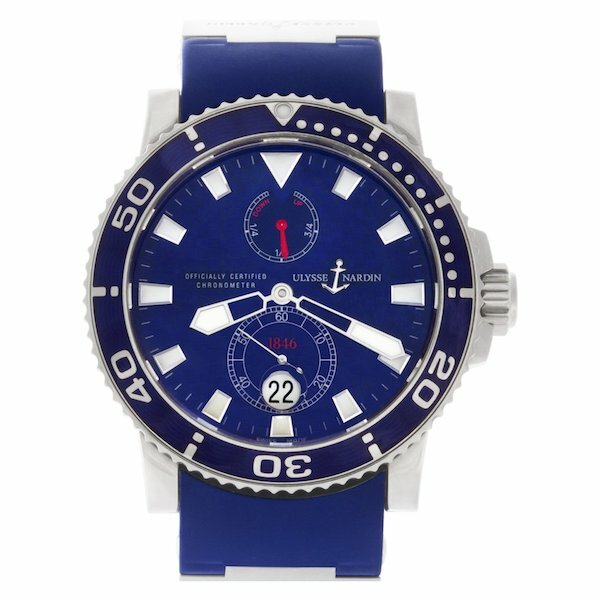 Knows as the “Blue Surf” special edition, the Ulysse Nardin Maxi Marine Diver ref. 263-36 is more approachable thanks to its stainless steel construction. Limited to just 1846 pieces—as a tribute to the founding year of the company—this Maxi Marine Diver Blue Surf takes its name from the blue wave patterned dial inside the 43mm steel case. On that eye-catching dial we see a similar Maxi Marine dial layout as the previous precious metal editions we covered except for the silver-toned large wave that sits at 12 o’clock. The blue bezel includes the wavy motif similar characteristic of the collection, setting the background for the raised steel numerals and markings. This time, rather than a rubber strap, the Ulysse Nardin Blue Surf comes equipped with a full steel link bracelet, emphasizing the everyday sporty appeal of the luxury dive watch. Interestingly, the automatic movement viewed through the sapphire caseback has been color treated to also be in blue, perfectly fitting the theme this Ulysse Nardin timepiece. 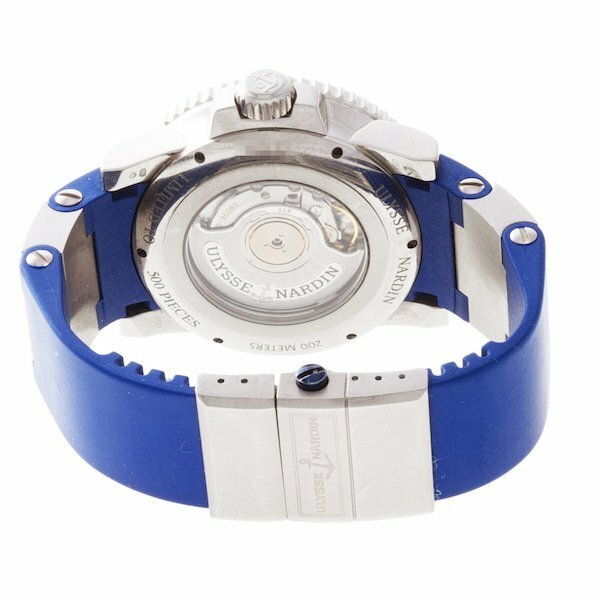 Along with the fantastic design and technical abilities of the Maxi Marine Diver from Ulysse Nardin, another appealing aspect of owning one of these is that you won’t find it out in the wild as much as the more common Rolex Submariner or Omega Seamasters. A high-end dive watch that proudly stands out as different from the rest.